We consider verifiable secret sharing (VSS) and multiparty computation (MPC) in the secure-channels model, where a broadcast channel is given and a non-zero error probability is allowed. In this model Rabin and Ben-Or proposed VSS and MPC protocols secure against an adversary that can corrupt any minority of the players. 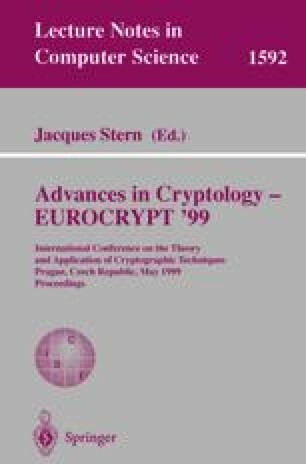 In this paper, we first observe that a subprotocol of theirs, known as weak secret sharing (WSS), is not secure against an adaptive adversary, contrary to what was believed earlier. We then propose new and adaptively secure protocols for WSS, VSS and MPC that are substantially more efficient than the original ones. Our protocols generalize easily to provide security against general Q 2-adversaries. Supported by the Swiss National Science Foundation (SNF), SPP 5003-045293. Basic Research in Computer Science, center of the Danish National Research Foundation.